Cut the fish into small pieces and wash thoroughly. Add turmeric powder and salt to it for marinating. Make a paste of mustard, garlic, red chili. Cut the onion and tomato into slices. Heat a pan and Put oil and fry the fish. Putting the pan again on medium flame take a little oil. Add cumin seeds and mustard ½ tea spoonful each. When the cumin seeds and mustard start cracking add the sliced onions. Stir a little. Add the tomato/mustard/garlic paste, turmeric powder, red chili powder and salt to it. Also add 3 to 4 cups of water. 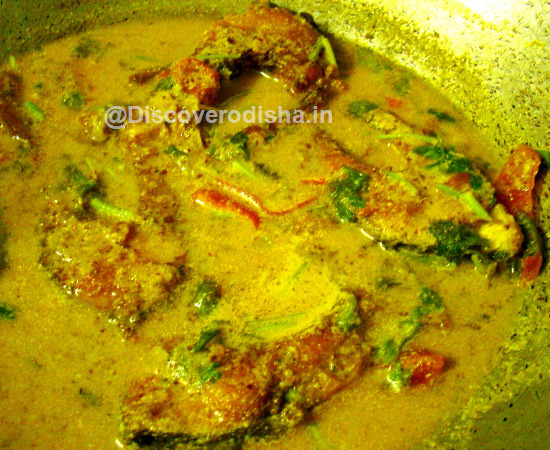 When the curry starts boiling add the fried fishes and boil it further for about 3 minutes. Maccha Besar is now ready to be served with rice.